I've been very busy re-architecting and extending the planning system to incorporate a better road UI, zoning, smart buildings and multiplayer. It's a hugely complicated endeavour, but I made good headway and even have some first visible progress, which I would like to use to give you a preview of what's to come. Looking further into the future, the general motive behind a lot of my code architecture decisions was to make smart defaults with optional precise overrides possible for every aspect of planning. 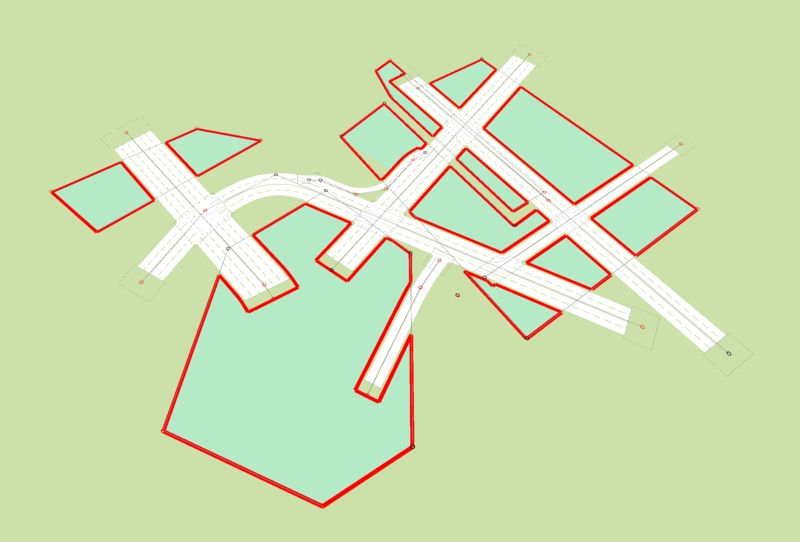 For example, intersection geometry, turning lane configuration and traffic light timing is chosen automatically, as reasonably as possible - while still supporting manual changes to each detail by editing the plan. All that's missing is the UI for that. In the old implementation that was entirely impossible. Second, all of this is written with collaborative planning in mind. Both in the sense that multiple players might be working on the same city and even the same area, potentially having conflicting ideas - as well as in the sense that the player is preparing plans at the same time as the city's construction companies are acquiring and developing lots. Making sure that the system stays clean and still supports all of this parallel ongoing development was a very hairy design problem, but I'm really happy with the architecture that I have now. The best thing about it is maybe that mods will be able to make use of this general planning principles, allowing the same combination of automagic calculations, precise manual modifications and collaborative editing for any topic which the mod might be about! I'm really looking to the next release and to all the opportunities this opened. I can't tell yet how much more time I need, there is still quite some UI work and polishing left. But I will keep you in the loop!